1. Boil chicken until cook all the way through. For bone-in chicken, this takes about 35-40 minutes. Fill a large stock pot with water, add a heaping pinch of salt, add chicken, and bring to a boil. Drain water, let cool, and pull chicken off the bone and shred. Set aside. 2. Melt butter in a large skillet and saut� onions on medium heat. 4. Melt all ingredients together and add shredded chicken. Let simmer for about 10 minutes to combine all the flavors. 5. Remove mixture from heat and let cool for about 5 minutes before filling tortillas. 7. Fill tortillas with a large spoonful of chicken mixture and roll. Place rolled tortillas in baking dish. 8. Cover enchiladas with jack cheese and whipping cream. Optional: Oil -- original recipe calls for heating tortillas in oil before rolling. If using fresh or soft tortillas, this step isn't necessary. If you choose to do this step, get oil very hot and heat tortillas, about 10 seconds on each side and keep warm before filling and rolling. You can also add diced jalapenos for spice. 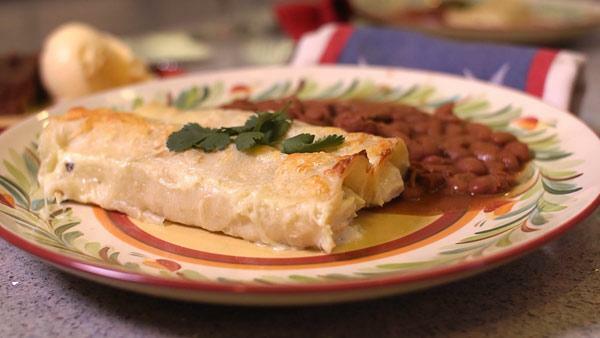 Party Tip: Enchiladas can be assembled ahead of time -- just leave off the cheese and whipping cream until ready to cook. Cover tightly and store in fridge. Before baking, remove from fridge, add cheese and whipping cream and bake. Be cautious of putting a really cold pan into a hot oven. I usually don't preheat the oven when I prepare them ahead of time -- may need an extra 5-10 minutes without preheating.